We can place all the things in the universe–tangible and intangible, actions and inactions–into three broad (overlapping) categories: natural, unnatural (or produced by man), and supernatural (driven by God). Inside our circle of what’s naturally occurring, we may find things like trees and native forests, wetlands, wild animals, oceans, rivers, natural resources like oil or natural gas. All of these things we consider “natural.” These things are within the supernatural circle as well because all that is natural we see as created by God. 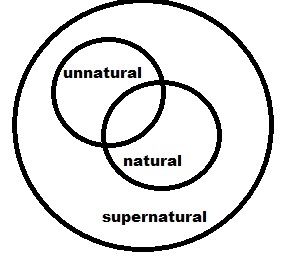 And I believe there are natural-unnatural overlaps. For example, a grain of wheat. The wheat we have today resembles its ancient ancestors in very little respect. This isn’t due so much to a natural evolution as it is to cross pollination, genetic engineering, and other forms of modification. Domesticated animals–dogs, cats, chickens, and cows–are natural creatures that have been affected by man. Other natural-unnatural overlaps may include infertility treatments that use natural products (sperm and eggs) mixed with science to enable pregnancy. Or even natural things that are used by man to create something else, like paper (from trees) or cotton clothing. Some things are exclusively supernatural–that is, they wouldn’t be lumped in with any other category. As an example, the resurrection would be considered wholly supernatural. There is nothing natural about a dead man rising from the grave. And there is nothing man can do to enable a dead man to arise from the grave. This is something God has done at specific times (Lazarus, Jesus, the 500 who arose when Jesus died, etc.). He has never done it by employing man in any way to accomplish the task (Jesus did raise Lazarus from the dead–but we see this could be done only because he was fully God in addition to being fully man). And I believe Love is supernatural. We know that God is Love (I J0hn 4:8) and we cannot love but that God allows it and pours something of himself into us. Some things–like love–are supernatural whether we choose to acknowledge their source or not. The key to the picture remains that all things, naturally occuring and produced by man, must be linked in some way to the supernatural. The very fact of existence at all connects us to the supernatural. But at the same time, we are least likely to recognize the supernatural in our daily lives. I submit that we tend to forget who is really behind the inventions we take for granted. We tend to forget who is behind the food we eat or the scenery we witness–whether rolling virgin hills or unforgettable city skylines. Because if we can live our lives always looking for and finding the supernatural, we will be so much more in tune with our Creator, so much more appreciative of his love for us and his role in our lives. I think recognizing the supernatural in the everyday is a key to a more abundant and more joy-filled life. Lord, give me eyes to see your hand in the basic, the mundane, the normal. Let me recognize your presence and inspiration in the world around me. Categories: And Faith, Finding Things to Be Thankful For, God's Will | Tags: engineered, God, human, manmade, mundane, natural, science, science vs. God, supernatural, unnatural, venn diagram | Permalink. Love this!! The supernatural is everything we have learned about since being at our new church – I can’t believe I had to wait so many years to be so in tune to the Holy Spirit and the power of the supernatural!! Trusting that it’s nothing we will do in the natural to bring our babies, but everything the Lord will do in the supernatural!